Nara, Japan, is a place where you can live out your childhood dream of being a fairy tale princess. You can skip along the dirt paths surrounded by emerald moss and be followed by deer like you are Snow White. After petting the deer and whistling whimsical tunes, you unfortunately snap back to reality and stare at the towering ancient structure in front of you. Todai-ji Temple. The deer must know how special and holy it is, for even they will not enter the temple. Instead, they carefully watch the visitors pass in and out. 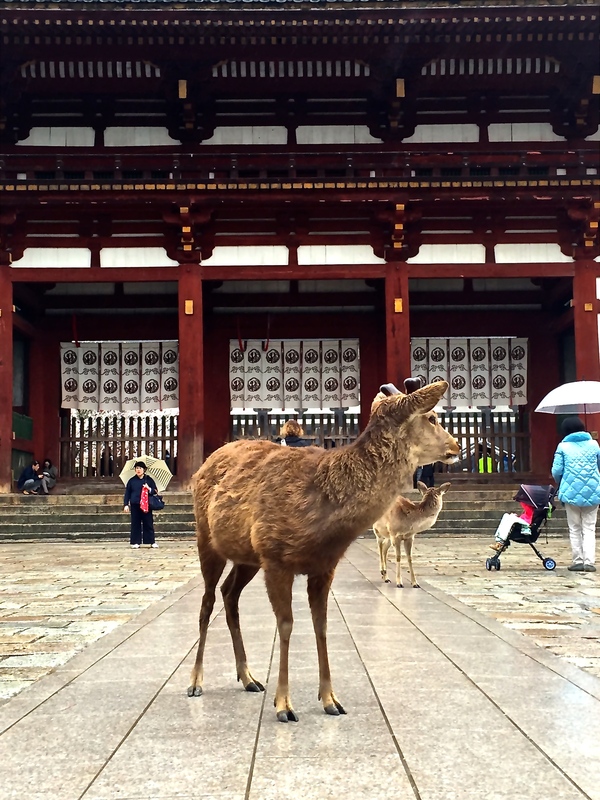 If you are lucky, you might witness a few of the deer bowing towards the temple when they think now one is looking. Temples in Japan are wonders in themselves, but the Todai-ji Temple is both intimidating and welcoming. Not only is it one of the largest wooden buildings on earth, it holds one of the biggest bronze Buddha images in the world. It’s no wonder that the construction of both masterpieces almost brought Japan to the brink of bankruptcy! Walking up to the temple, you feel it growing in size at an alarming rate. From far away it looked big, but as I stood in front of the temple doors I realized how severely I had underestimated its size. As I stared in awe at the wooden structure towering over me, I felt myself being pulled into the temple. The Daibutsu (Great Buddha) sat before me, welcoming me inside. The Daibutsu‘s hands were crafted so that they would send the messages ‘welcome’ and ‘fear not’ to the temple’s guests. 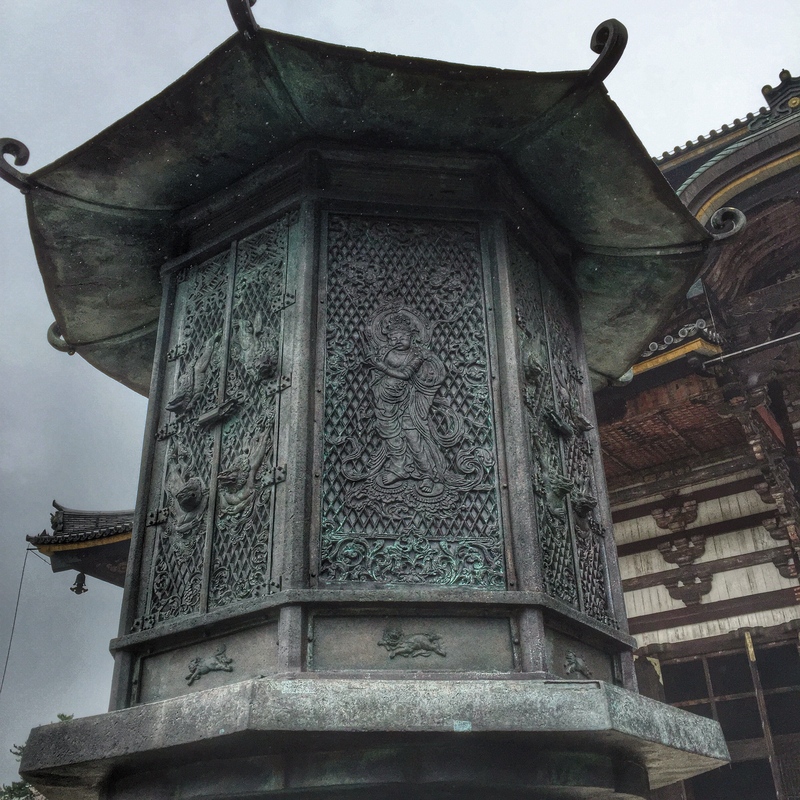 There are other statues and artifacts inside the temple, but it is hard to even remember them. All I can think of is the Daibutsu sitting so gracefully in the middle of its wooden fortress. The Buddha and temple were built with special attention to detail. It is not loud inside. Everyone seems to tip toe and enjoy the peaceful atmosphere. I snapped away with my camera because what photographer could resist capturing the enormous Buddha’s face and body? 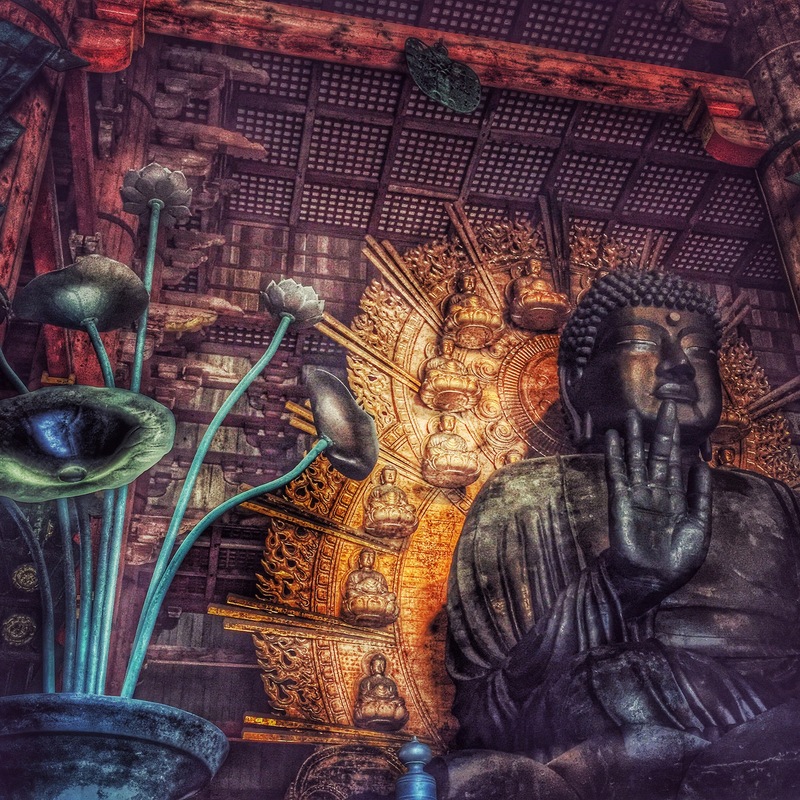 The tarnished green hue of the flower sculptures, gleaming bronze sun bursts radiating out from behind Buddha, and the cherry stained wooden beams housing the Buddha are remarkable. They all create a perfect frame for a timeless and unforgettable image. 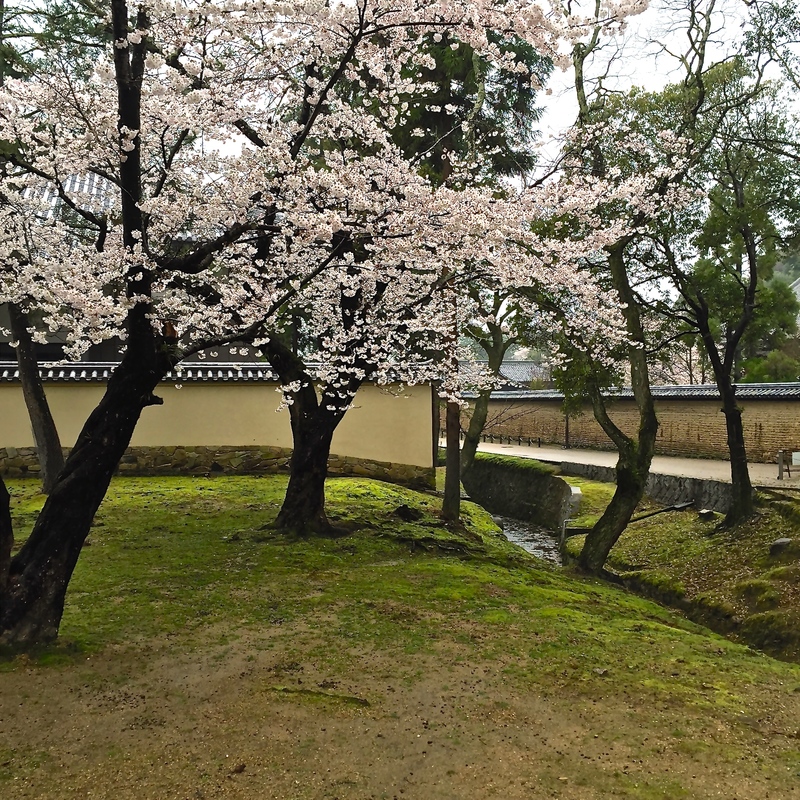 If you do have the chance to visit Nara and witness the Todai-ji Temple for yourself, don’t forget to take the time to truly appreciate the wonder that lies in front of you. Put your camera away. Find a corner to sit or stand in by yourself. Spend a couple of minutes observing the crowds and the sculptures that call this temple their home. Close your eyes and try to imagine what it would have looked like hundreds and hundreds of years ago. Smile at the Great Buddha and silently thank the Emperor Shomu for ordering the construction of this elegant gorgeous temple so many many years ago. 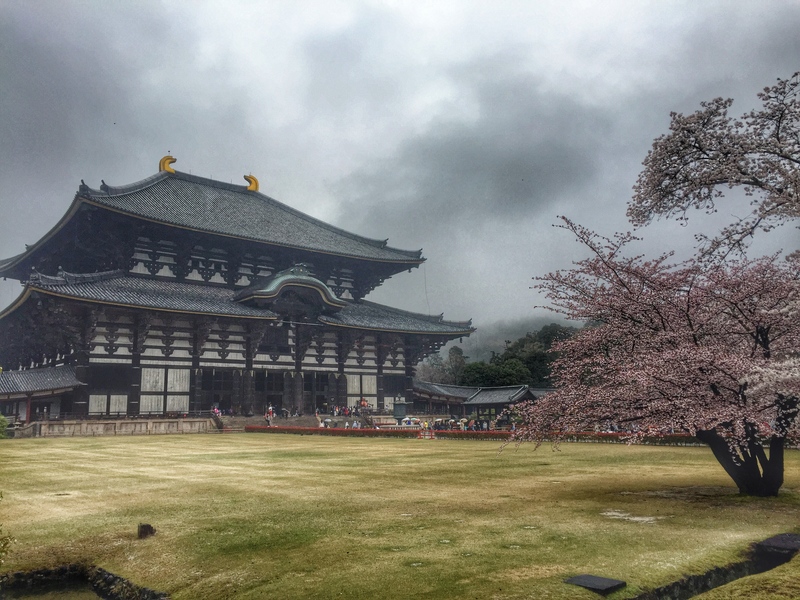 Tags: Buddha, Daibutsu, deer, Japan, Nara, peace, Tadai-ji Temple, temples, travel, wanderlust. Bookmark the permalink.